After 56 days of well-functioning logistics we all look forward to the data analysing and research publications to come. Despite our northerly position at 89°N, we have a surprising amount of life around us. In the water and under the ice, there is algae, and when it comes to birds, we've had both black guillemots and northern fulmars visiting. 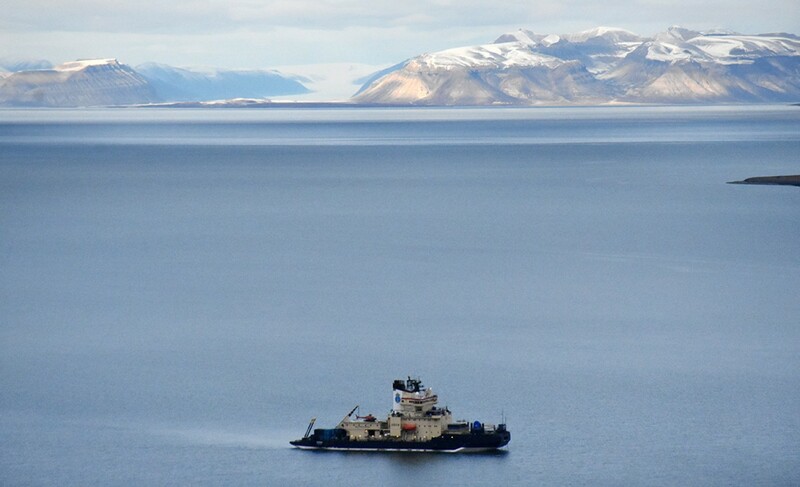 The icebreaker Oden is currently moored at a large ice floe approximately 89°30'N. 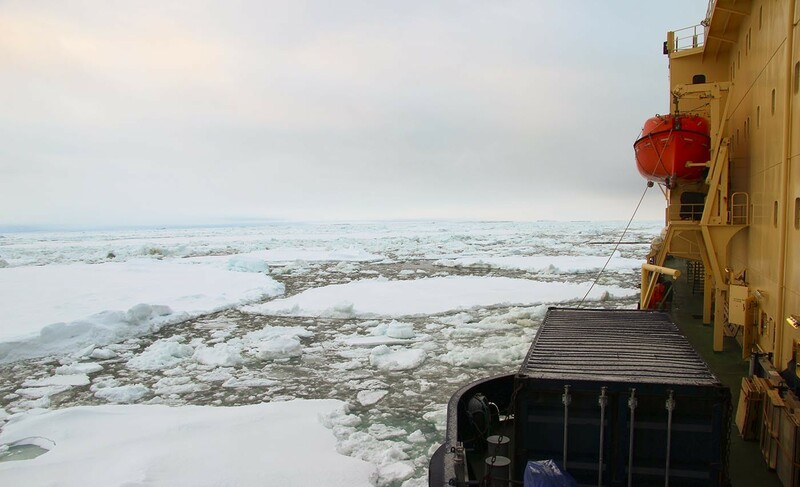 You can read more about what has been happening on board and out on the sea ice during the past week in the weekly letter from Oden's captain. It has been busy days since we arrived to our ice floe. Directly after arrival, we spent almost three days setting up instruments, building infrastructures and finding safe routines for all our work tasks. 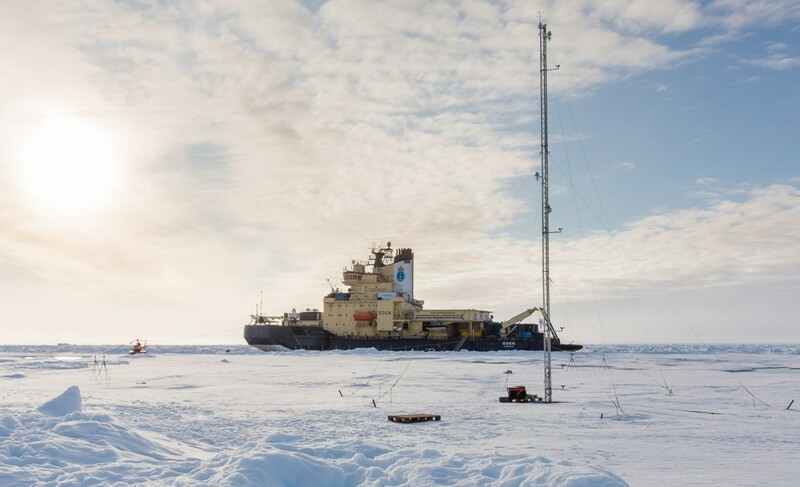 On Sunday 12 August, we reached our northernmost position at the North Pole and collected water, drilled ice cores, and made air measurements. A little more than a week has passed since we left Longyearbyen and started this summer's expedition Arctic Ocean 2018. We have since managed to get to position 89°15'N, 60°20'E. 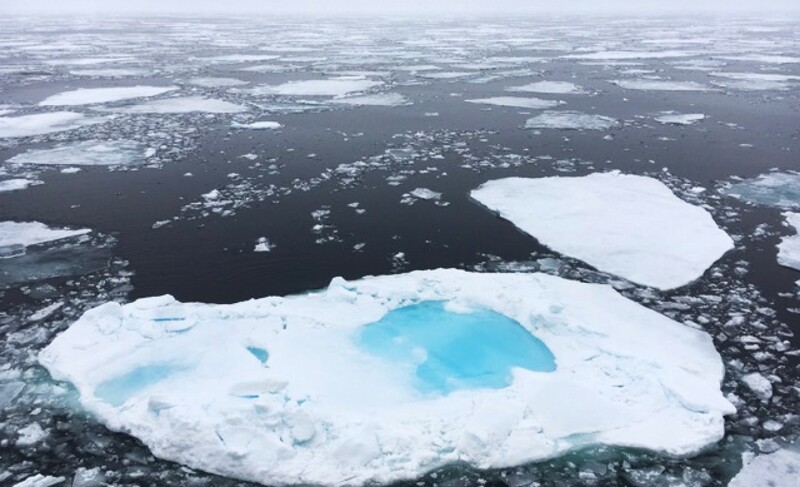 Andrew Margolin is a marine carbon biogeochemist at Virginia Insitute of Marine Science and has blogged about the first week of Arctic Ocean 2018. 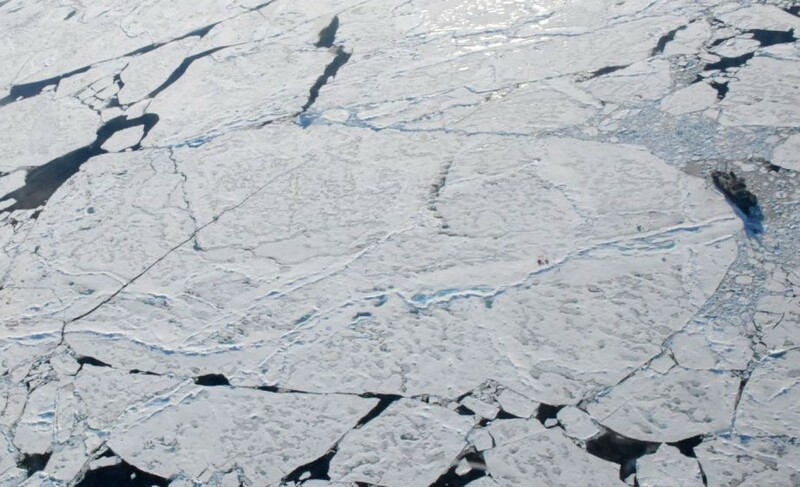 About a day and a half after beginning the journey, Oden reached the marginal ice zone, where ice begins to appear on the ocean surface. The first measurement station was here. This station will serve as a point of reference to compare with the findings near the pole. Physicist and BBC presenter Helen Czerski blogs about the first days of the expedition. Are you wondering where the icebreaker Oden is right now? Then there's a way to find out! 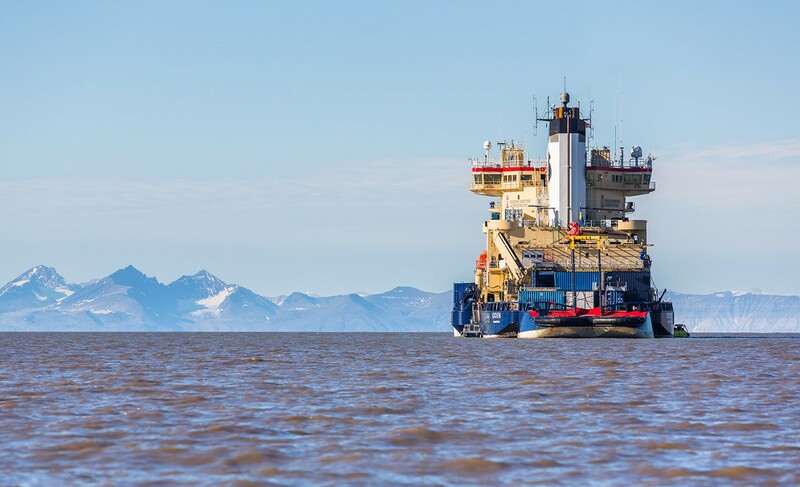 We are now in the final preparation phase, ready to departure from Svalbard. 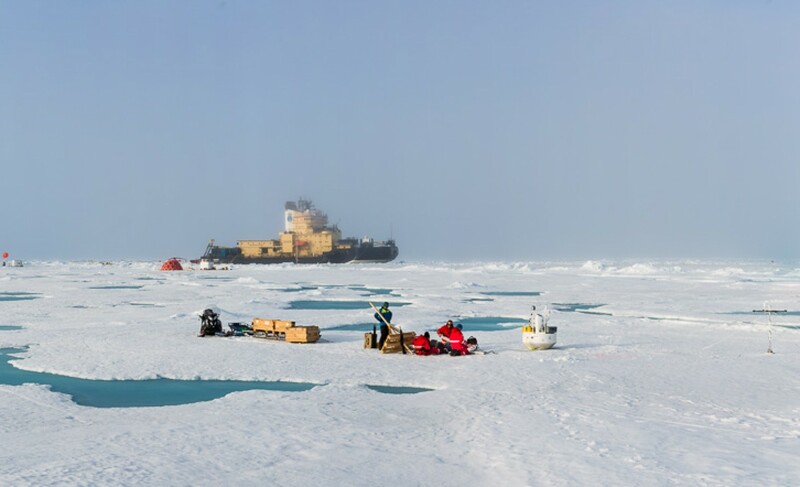 This summer, the Arctic Ocean 2018 research expedition will study the Arctic system to better understand how it may change in the future. 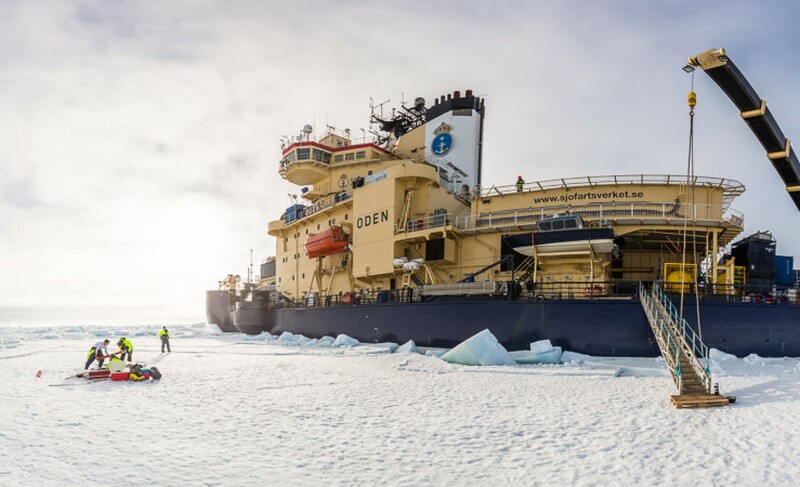 Researcher Helen Czerski writes about the aim of the expedition on board the icebreaker Oden. 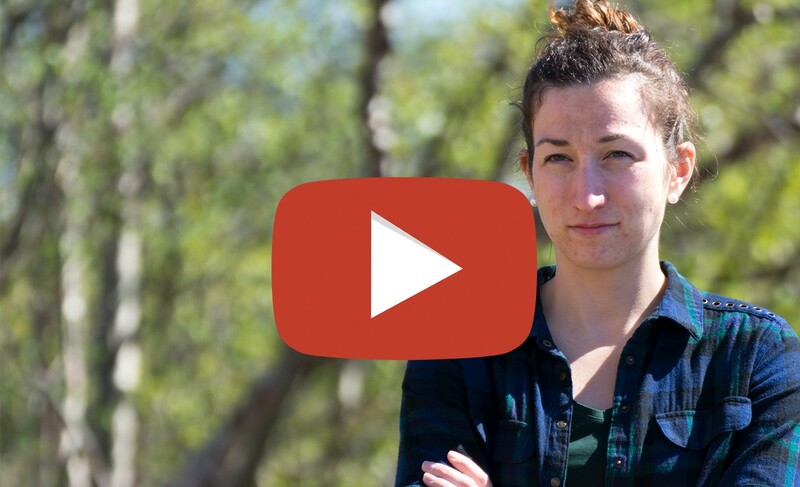 What happens to species when the climate changes? 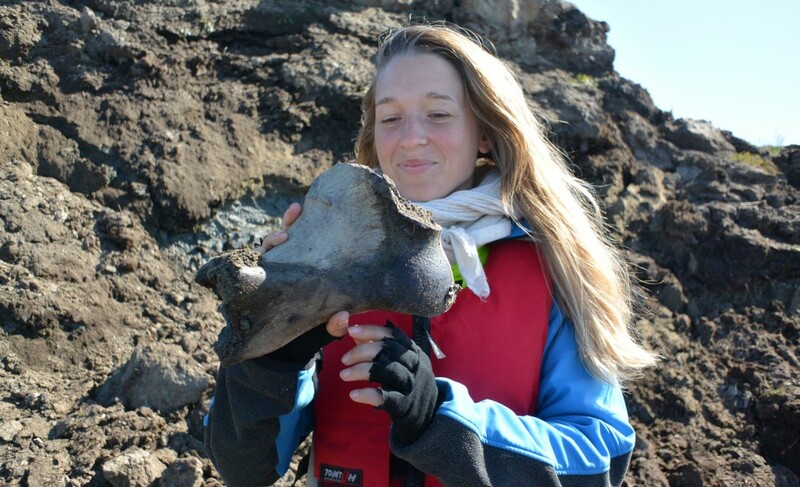 This summer Patrícia Pečnerová from The Swedish Museum of Natural History, is going to Wrangel Island. 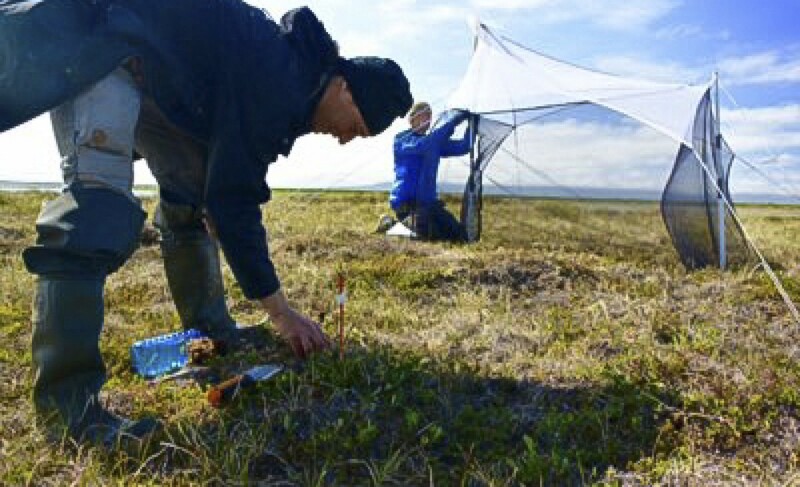 Originally it was a small hill in the Siberian mainland, but about 10,000 years ago when the last Ice Age ended, sea level rose due to temperature rise and it became what we today know as the Wrangel Island. The oceans might be full of mammoth ivory, but you will not find this! I pick up the muddy piece of what looks like rotten driftwood. I turn it around and I see straight away that it's not a piece of musox that I hold in my hand. I still have a lot to learn about fossils, but this was a jawbone from some kind of predator. Three black big pointed teeth makes it unquestionable. When the water level of the Chaun River rises, the water clean the beaches from loose material and vertical walls with frozen soil get exposed. Its like these walls are made for historical sampling. 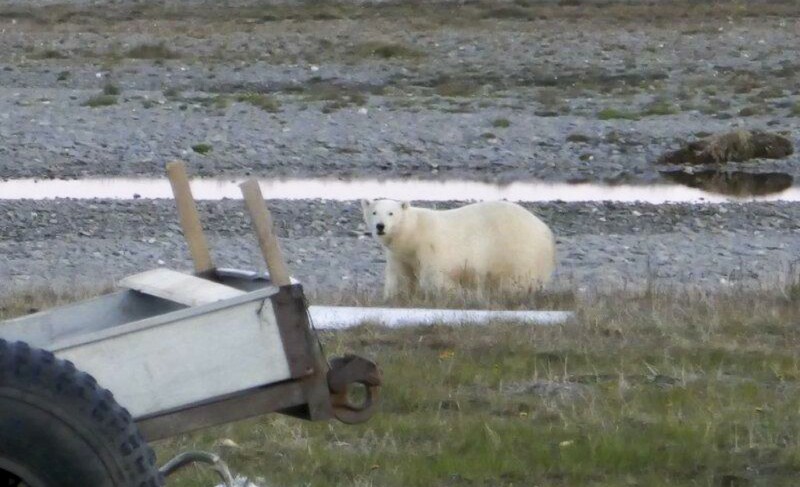 The young polar bears are often wandering around the island, curious and inexperienced. One late night a young female polar bear visited our camp. I went out in my long johns tails and went around the corner of the house . 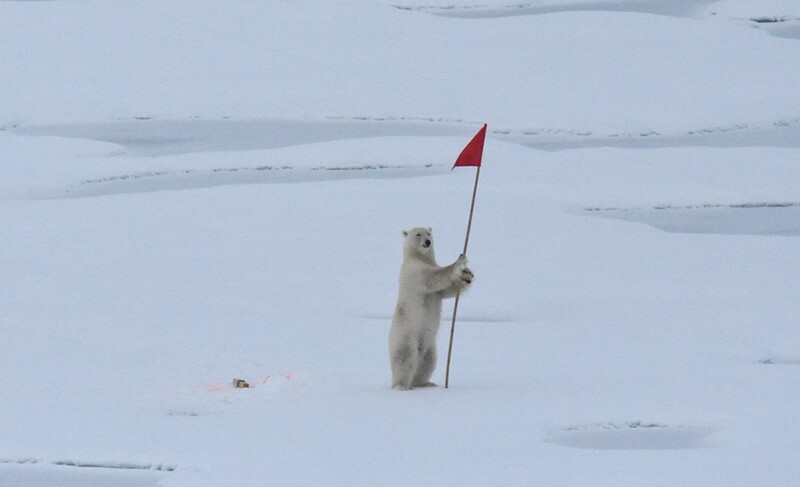 The polar bear did not see me and I did not see the polar bear. But Alexei Tichonov saw her from her window and shouted: Go into house! Polar bear very close! We're back! We made it! More stories later... have to run. The research station in the Chaun delta is located on a low island with many lakes and marshes. 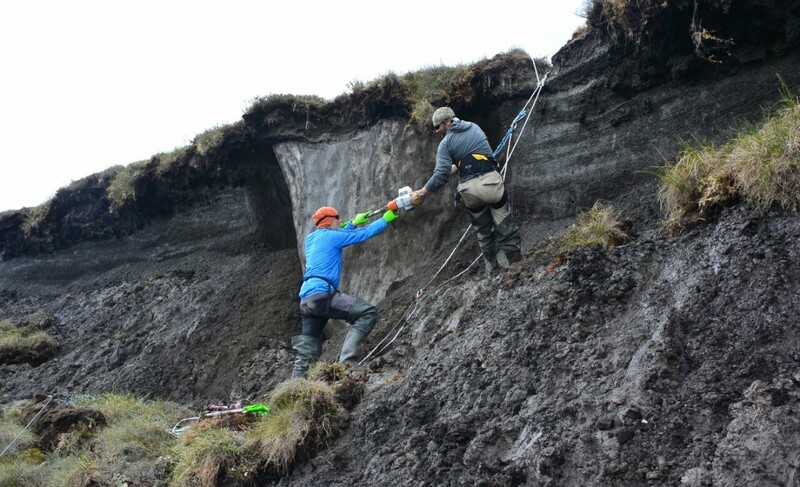 As the permafrost soils melts the lakes dry up, and some areas are now consisting of former seabed.